French cartoonist Luz has stated that he will no longer draw the prophet Mohammed. 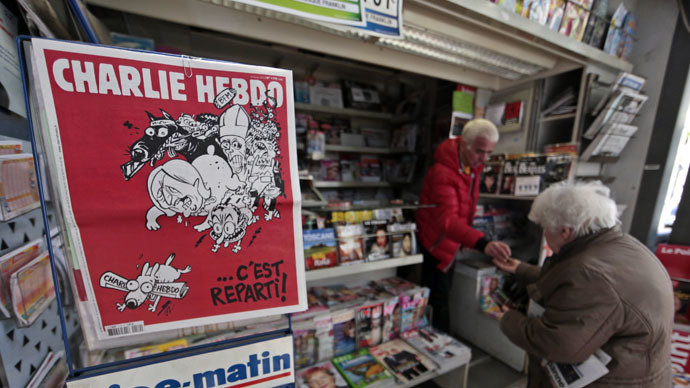 Luz made an illustration of the prophet on the front cover of the Charlie Hebdo magazine following the terrorist attack, which killed 12 people at the magazine’s office. "He [prophet Mohammed] no longer interests me," Luz said in an interview with the French magazine Inrockuptibles, which was published on Wednesday and cited by Reuters. "I've got tired of it, just as I got tired of drawing Sarkozy. I'm not going to spend my life drawing them." Renald Luzier, who is otherwise known as Luz, was responsible for producing the front cover image on January 14. It showed a cartoon of a tearful Mohammed holding a “Je suis Charlie” (I am Charlie) sign below the headline: “Tout est pardonné” (All is forgiven). Luz narrowly missed being caught up in the terrorist attack, as he was 30 minutes late for work. He had overslept on the morning of January 9 as two Islamist gunmen entered the magazine’s office and killed 11 people, leaving another 11 injured. “The terrorists did not win,” Luz told Les Inrockuptibles. “They will have won if the whole of France continues to be scared,” he added, accusing the far-right National Front of trying to stir up fear in the wake of the attacks. The post attack issue managed to raise a total of €8 million ($8.9 million) in sales. Five million copies hit newsstands on January 14, in 16 different languages on Wednesday, each selling for €3 ($3.35). All proceeds from the sale of the edition went directly to Charlie Hebdo and the families of the victims.